Ever since I was a kid, I’ve been fascinated with dinosaurs. And astronauts, actually. All my friends had little green plastic army men that were used to stage great battles of some miniature war, usually out in the backyard somewhere where clods of dirt could be heaved at enemy plastic soldiers to simulate bombs and grenades. Casualties tended to be high, since the soldiers were the same color as the grass, which was also taller than they were. But I digress. I, on the other hand, had hundreds of little plastic astronauts and dinosaurs. There was no set color; they came in greens and blues and reds and purples and so on, so they rarely got lost in the grass. I had a pretty cool toy model of the Apollo rocket that actually had separating stages, each of which I stuffed full of astronauts. The usual scenario involved my landing rocketfuls of astronauts on some prehistoric planet that time forgot, and the battles that ensued were pretty fantastic. Man versus monster with ray guns and rockets, all manipulated by a very giant puppet master, me. And although I continue to have great admiration for astronauts, I gave up on the idea of ever becoming an astronaut when I realized they have to do a ridiculous amount of math, and I think any amount of math is ridiculous. Also, by the time I had reached young adulthood, I couldn’t ride on a playground merry-go-round without getting sick to my stomach, so I kinda ruled out any job that would require me to pull five or six Gs as part of the daily work routine. Sigh. The dinosaur thing, however, continued to be a fascination. Not enough, apparently, to dedicate my life to loping around in the desert with a shovel and a brush, looking for bits of bone fragments and teeth and trying to piece them together into something recognizable as a very long extinct lizard. Yeah, I know, they’re more closely related to birds. But when I was little, they hadn’t figured out the avian ancestral connection yet. But back then we also foolishly believed that Pluto was a planet. So twentieth century. So, over the years, whenever I’m visiting a museum, I always make my way to the dinosaur exhibits and stand in awe of these giant creatures, reverently and meticulously reassembled by teams of unknown paleontologists who manage to put together hundreds of bones and other bits to end up with something that is, at best, their best bet as to what this thing probably looked like millions of years ago, before most of his buddies turned into crude oil. It’s a kind of mulligan stew of magic and science and imagination, requiring both the scientist and the civilian to participate in bringing these creatures back to life for a moment. I still find it thrilling to stand next to the bones of something bigger than my house, and imagine how differently I might be acting if he and I were both alive at the same time, and how far could I possibly run before he caught up to me and made me part of history. So you can understand why, 22 years ago, I happily plunked down my four bucks to go see Jurassic Park. (Yes, in the late twentieth century, you could by a movie ticket for four dollars. And that wasn’t even the matinee pricing.) Sitting in the dark for two hours watching Steven Spielberg and company bring dinosaurs to life was mind-blowing. These were not the stop-motion animated clay models of Ray Harryhausen (Mighty Joe Young, Earth Vs. the Flying Saucers, Jason and the Argonauts, Clash of the Titans, etc. ), but a technique so new and believable that you were nearly convinced that they had actually found some real, live dinosaurs. CGI had arrived, and we were now a million years from standing next to skeleton in a museum or staring at a scale model of what the skeleton might have looked like with skin. Dinosaurs were real. The basic premise was scientists had been able to crack the genetic code of dinosaurs by extracting blood from a mosquito, which had been perfectly preserved for millions of years inside amber (some ancient, petrified tree sap), and they were able to somehow bring these prehistoric creatures to life in a lab. Test tube dinobabies. So, ignoring the basic rule of “just because you CAN do something doesn’t mean you SHOULD do something,” they decide to resurrect a whole bunch of species they know nothing about and populate an island amusement park with them. And invite the general public to come and look at them. They spared no expense, and naturally, they have the absolute finest containment systems in place, highly trained staff, the world’s top geneticists, preeminent paleontologists, loads of money...what could possibly go wrong? Well, everything. And it does, and that’s your movie. Dinosaurs get loose, systems fail, people get eaten, and the park never opens. Lesson learned: we never should’ve open Pandorasaurus’ Box. A couple forgettable sequels follow, and the Jurassic Park trilogy becomes part of film history, up on the shelf, and even the coolness of the CGI is eventually overshadowed by cooler, better computer graphics. But what’s old is new, especially when you’re in the business of bringing dinosaurs back to life, so it’s probably about time for another installment. Enter Jurassic World. Somehow, 22 years after the disastrous attempt at opening a park where the attractions themselves had designs on the tourists, investors with more money than morals and scientists with a serious god-complex somehow get together and decide the best thing they could do with their considerable brains and bucks is to reopen the park full of dinosaurs and invite the general public back in for a good time. On the surface, it seems like a pretty dumb idea to me, but human beings, on the whole, have very short memories, particularly when it comes to learning from previous dumb ideas. So we find the park open and full of thousands of visitors. In fact, it’s been open for some years, apparently, so long that folks have somehow grown tired of the same-old, same-old dinosaur attraction. T-Rex eats goat. Yawn. Herds of triceratops roaming the fields. Seen it. Give me something exciting. As a result, they bring in corporate sponsors and up the ante, introducing new creatures and new spectacles. We join the story as they’re about to unveil a whole new dinosaur, something so big and so fantastic that it will make the tyrannosaurus look like a house cat. They’ve also got this ex-special forces guy (played marvelously by Chris Pratt) who is studying and working with a small pack of velociraptors, learning how they communicate and hunt. He has imprinted on them as the alpha-male, but they’re a very long way from being a lovable bunch of hunting dogs. Lurking around Chris Pratt’s character is a somewhat shady fellow who appears to be affiliated with the military and some other group, although who that is, is not immediately clear. He wants to turn the velociraptors into a viable military fighting force and is pressuring Pratt and others to work toward that end. Meanwhile, the director of the whole park is played by the lovely Bryce Dallas Howard (who happens to be Ron Howard’s daughter). Her young nephews are visiting for the weekend, but she’s really swamped with a big corporate sponsorship meeting and such, so she pawns them off on her assistant. By now, you’ve probably figured out the basic plot line, just from the information I’ve laid out. In fact, there weren’t very many times I was truly surprised during the movie, and it all worked out pretty much as I guessed it would. But so what? This film was lots of fun, despite its predictability. The dinosaurs were so believably real, it made the ones from the original movie look like claymation. Because the park was open and established, it was far more interesting as it spread across thousands of acres, and rides were operated by disinterested, pimple-faced teenagers earning minimum wage while parents dragged their kids around buying overpriced drinks and cheap dinosaur toys as souvenirs. There are some interesting folks in the control room where all park activity is monitored, and they manage to occasionally blend real human emotion with some pretty funny moments. But the first 40 minutes or so of the film basically serve to get us to what you know is going to happen before you ever buy your ticket: something goes terribly, horribly wrong. Dinosaurs escape, people get eaten, the two nephews get lost, and Howard and Pratt have to go rescue them. There may also be some kissing. In the midst of the chaos, the military nut job decides this is the time to put the velociraptors to the test, and it’s no surprise at all that this doesn’t end well. There’s a lot of shooting and chasing and blowing stuff up. Dinosaurs eat more people. Buildings get trashed. There was even a moment, toward the end, that reminded me a lot of an old, Japanese Godzilla movie, but with way better special effects (most notably: these weren’t guys in giant rubber suits). So, predictable? Yes. Enormously fun? Yes. Scary at times for children and people with heart conditions? Uh, did I mention very believable CGI dinosaurs were eating people? People looking for lovable, huggable dinosaurs should check for reruns of Barney or the Flintstones. But, it was still a very enjoyable movie. Chris Pratt (Parks and Rec, Guardians of the Galaxy) has turned into an extremely likable if not unlikely leading man, sort of a cross between Indiana Jones and Jim Rockford. 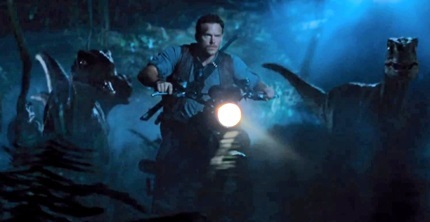 There are some moments of absolute coolness, like when he’s riding his motorcycle at a high rate of speed through the jungle, while his pack of velociraptors races along beside him. And he’s got some very funny lines, delivered as only he can do. There’s an awkward but charming chemistry between him and his leading lady that, to me, was sort of reminiscent of Clark Gable and Claudette Colbert in It Happened One Night. And for those of you don’t know, back in the day, nobody was cooler or more macho than Clark Gable. So here’s the bottom line. There are plenty of holes you could pick apart in the plot, lots of things that stretch credulity, and moments of unbelievable coincidence. But give me a break; you chose to suspend disbelief from the moment you bought a ticket to a movie about dinosaurs brought back to life in an amusement park. That’s a pretty big pass, so you have to give them wide berth to tell their story and have fun with it. Every time you’re tempted to say, “c’mon, that can’t be happening,” remind yourself that you bought a ticket for a movie about dinosaurs living on an island off the coast of Costa Rica in 2015, and they interact with tens of thousands of people every year who casually stroll around with baby strollers and balloons, eating hot dogs, never once worried about being eaten themselves. There’s nothing wrong with that; it’s pure escapism. And it takes me back to when I was the one in the control room, monitoring the very believable battles between well-armed astronauts and terrifying, plastic, prehistoric creatures, all while I ate my lunch.